Once opened, keep refrigerated and consume as soon as possible. 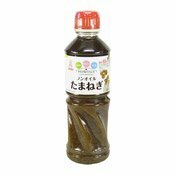 Ingredients: Water, Onion (20%), Spirit Vinegar, Soya Sauce, Fish Extract, Hydrolysed Soya Protein, Thickeners (E1412, E415), Flavour Enhancer (E508), Dried Onion (0.5%), Flavour Enhancers (E621, E631, E627), Salt, Dried Shiitake Mushroom, Yeast Extract, Onion (0.2%), Sweetener (E955), Flavouring. Simply enter your details below and we will send you an e-mail when “Onion Dressing With Sweetener (日式和風調味醬汁)” is back in stock!